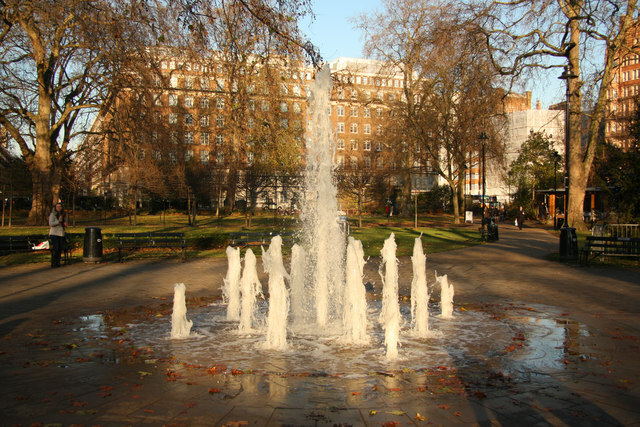 At 6 acres, this is one of the largest garden squares in London. And even on this cold January day (my first London visit of 2017) it’s pretty busy; scatters of visitors enjoying this airy space, figures seated on sunlit benches, people hurrying briskly through, school groups marching the diagonal between the British Museum and the Russell Square tube station. And, with its close proximity to University College London (UCL), which occupies many of the buildings on the north and west of the square and beyond, there are plenty of students racing the shortcut across to lectures or taking a break here. A girl is cross legged on the grass playing a guitar and singing. Breath steam wisps with her song. A young guy filming on his phone. I stroll the sinuous paths across and all around the park looking for a suitable view to draw. I’m attracted by the long tree shadows raking across the lawns and the lacework patterns decorating nearby trunks cast by the lime tree tunnel. Reflected stabs of light dazzle between winter branches from windows of the buildings around the square. The earliest written mention of this area which was to become Bloomsbury is in the Domesday Book, described as fertile land with vineyards and a “wood for 100 pigs”. In 1202 a carucate of this land was sold to the Norman landowner, William de Blemont (a carucate was a medieval unit of land which a plough team of eight oxen could till in a year: about 120 acres). For the next 200 years his family developed and managed the estate, which became known as the manor of Blemundsbury. At the end of the 14th century, Edward III acquired the land, and bestowed it to the Carthusian monks of Charterhouse Priory, who leased it out for farming. In the 16th century, during the Dissolution of the Monasteries, Bloomsbury manor was seized back by the Crown and granted to Thomas Wriothesley, 1st Earl of Southampton, a loyal counsellor of Henry VIII. His great grandson, the 4th Earl, built stately Southampton House in 1657, later Bedford House, on what now is Bedford Square, just west of here. After his death, his daughter married William Russell, son and heir to the 5th Earl of Bedford, bringing the Bloomsbury Estate into the Russell family. I set up to draw the curving ribcage of the lime tree tunnel, underlined by shadow stripes. The Senate House Library, in it’s box- shouldered Art Deco solidity (when it opened in 1936 it was, at 209ft the tallest secular building in London) rises in the background behind the square’s terraces. And, in psychedelic contrast to the elegant and serious buildings around this square, I discover a brightly decorated feeding box for squirrels, jauntily fixed to a tree trunk, and decide to include this in my foreground. This area to the north of Bedford House was known as Southampton Fields, a mix of formal gardens, nurseries, pasture, and processions of lime trees creating a vista from the back of the house, with views across open countryside towards the village of Hampstead. It was developed from about 1800 when Francis Russell, 5th Duke of Bedford, had Bedford House demolished as he was no longer using it, and commissioned property developer James Burton to develop the land to the north into a residential area with Russell Square forming the focal point. Handsome terraces of brick and stucco were built, most of which still stand, with wrought iron balconies to overlook the gardens. The area came to be known as ‘Judge-land’ as many of the properties were taken up by members of the legal profession, Lincoln’s Inn and the Royal Courts being only a short carriage ride away. Russell Square garden was designed by Humphrey Repton after the success of his work for the Dukes of Bedford’s Woburn Estate. It was originally intended for the private use of the square’s residents and guests. A genteel Georgian playground, where they could walk the perimeter promenades while protected by a high hedge from any awkward encounters with tradesmen, street hawkers or grimy child beggars. They could parade the gravelled diagonal paths intersecting the lawns, to be seen and be sociable with their neighbours. Or through the rounded walk of the lime tree cloister, providing cooling summer shade and secret glimpses across the lawns. If they wished, they could find more private seclusion in seats under twining vines around a central shelter. Dominating the space then, as now, a statue of Francis Russell (by Sir Richard Westmacott) at the south gate, with his back to the garden. He stands high and proud, as benevolent agriculturalist, with a plough, and holding stalks of corn. Farm animals and allegorical farming figures beneath his feet. Millie leaves to get to a lecture. A young boy and girl run across and stand on either side of my easel to watch me draw. I say hello and the girl tells me she likes drawing animals. I scribble a little dog on my drawing for her. They carry on watching. The rest of the family arrive and gather behind me and stand there. I say hello to them and carry on drawing. They watch in silence. For just a little bit too long. Slightly awkward. In 2002, after changes to the layout in the previous few decades, the garden was re-landscaped in a style based on the original layout, reintroducing the serpentine paths from the four corners, weaving through the lawns and flower beds, and partial restoration of the lime tree tunnel. In addition, the café in the square was redeveloped and a new ornamental fountain installed. Not working today but when it’s warm, young children and drunk students love playing dare through the spurty water jets. I pack up and walk through the west entrance to buy a cup of tea from the cafe in the green wooden Victorian cabman’s shelter. Originally there were over 60 of these shelters around London, providing hot food for hansom cab drivers. Only 13 shelters survive, some still used, like this and the one outside Upper Grosvenor Gardens (see ‘Sticks in the Smoke’32), and some sadly redundant like ‘The Kremlin’ on Chelsea Embankment (see ‘Sticks in the Smoke’3). I carry my tea across to the eastern corner and set up to draw through the half moon shrubbery: a wintery mix of evergreens and complex patterns of twigs and dried stems and seedheads, towards busy Southampton Row. The squeal of buses and taxis and the wail of sirens surge through the open gates. My easel suddenly starts to shake. I look down: a squirrel is dibbling at the soil, its rear paw grips the leg of my easel. A tiny silver grey hand. A winter solstice leaden sky threatens rain as I approach Millbank Gardens, along John Islip Street and behind Tate Britain. The parade of roadside plane trees are leafless, their pollarded branches reaching up like gnarly arms shaking fists to the sky. Seeds dangle like Christmas baubles. Below, leaf imprints in the tarmac are like faded fragments of an antique tapestry. Millbank is a half mile or so riverside sweep south of Westminster, deriving its name from a water mill built by the monks of Westminster Abbey (see Sticks in the Smoke 39), that stood at the outflow of the River Tyburn into the Thames. Prior to the 1800s, this low and marshy piece of land was sparsely populated, merging into riverside mudflats, where mists would rise, pierced by the echoing call of snipe and the cries of gulls. Rough farmsteads squatted in these boggy meadows, cattle grazing down to the water’s edge. This ground was long considered unsuitable for housing or development. But the perfect place, away from the city, for incarcerating enemies and undesirables, where considerations for health and wellbeing were not high on the agenda. In 1651, four thousand Scottish Royalists were captured during the Battle of Worcester (the final battle of the English Civil War). They were force marched the 100 miles to Millbank and held here in a makeshift prison camp, where 1200 of these bone- weary prisoners died and were buried in mass graves. The survivors were sold as slaves and transported to the plantations of Barbados. Many of whom perished under creaking decks on the long ocean voyages. Two pieces of lime green training equipment have been installed on the central terrace of the garden (installed by The Great Outdoor Gym Company). They look like user- friendly torture devices. A personal trainer in pink top is putting her two clients through their paces: one a smallish young woman, the other a large man, like a bear in sports gear. As I walk the boundary paths, the trainer’s antipodean twang bounces around the garden: “Ok guys just 20 more seconds now……keep with it!” “C’mon! Don’t think about it, just do it!” I set up my easel and drawing things (that’s my exercise for the day!) next to the oblong brick pavilion, in case it starts to rain and I have to scoop my things under cover. I glance over: they’re now doing bench presses on the park benches. Guided by the spirit of Christmas, I choose a large variegated holly bush as my foreground and draw the view into the eastern half of this garden (see drawing above) where four Whitebeams (I think) grow from the lawns, displaying red clouds of delicate berries. I can just make out bright green bulb shoots cautiously emerging from a bare rectangle of earth. In the background an upper terrace behind ironwork balustrades, with large terracotta pots containing trimmed standard hollies. A fringe border of laurels and palms and evergreen shrubs. Graffiti adorns several of the rubbish bins. The trio have just finished doing crunches amongst the leaf litter. The large bearlike man lies on his back panting and groaning loudly! These gardens stand exactly central to where the Millbank Penitentiary was built in the early 19th century. This massive eight- sided structure covered a site of 18 acres. It rose grim and fortress- like from the muddy ground, having to be built on a concrete ‘raft’ to stop it subsiding. Six cell blocks heaved outwards, from a central circular core, where the main terrace of the gardens are today. It contained a chapel and the governor’s residence. Millbank was the largest prison in Britain, housing 1100 male and female convicts. However, the inherent dampness of this place seeped into the mildewed walls and, from its earliest days, fostered a general unhealthiness, contributing to epidemics of dysentery, scurvy and depression. In the 1840s, because of this, and the high running costs, long term prisoners were moved to other prisons and, this became a holding depot for convicts prior to transportation. They were held in solitary confinement for three months until their destination was decided (mostly Australia). After the brutal policy of transportation ended in 1867, Millbank reverted to being a local prison, before finally closing its heavy studded doors in 1890. You can still see the octagonal impression left by this structure on today’s street plan here, an indelible geometric ghost from a grim past. A blackbird flies a blue-black flash into the holly bush and chirrups loudly from its interior. A man comes through the gate, wearing a tall white knitted hat and clutching a whisky bottle. Tightly. He talks at me for 5 minutes in non-sequiturs, about how he used to draw but was told his line was too heavy; about the steep rise in council tax; and the cost of getting a haircut. The scotch in the half full bottle sloshing as he speaks (Later, while visiting the Tate, I see him curled in a booth seat opposite the Tate cloakroom, hat off, and fast asleep!). The forbidding prison walls and buildings were demolished and the site, now drained, was broken into large plots, subdivided by a grid of streets, with John Islip Street (named to commemorate John Islip, abbot of Westminster in the 16th century) bisecting north- south. For most of the 1890s and into the new century, the site echoed with the clang of construction; materials offloaded from barges moored where, only 40 years earlier, chains of convicts were being loaded onto transportation ships. The first building to be opened faced out across the Thames in its classical porticoed poise. This was the National Gallery of British Art, later to be known as the Tate Gallery (after its founder Sir Henry Tate, the sugar magnate) and more recently, Tate Britain. Its back is turned to Millbank Gardens; the only concession to art back here is a statue of John Everett Millais, Pre-raphaelite painter, brandishing his palette and standing sentinel on a high plinth. Next to the Tate, and filling the southern corner of the site, the Royal Army Medical College was built in a grand mix of Baroque and French Renaissance style. Since 2005, the buildings have been home to Chelsea College of Arts. Millbank gardens was laid out at the heart of the plan. A recreation breathing space for a new community of working families, housed in 17 redbrick mansion blocks, built by the LCC (London County Council) in the western half of the old prison footprint, using bricks salvaged from its rubble. Following Arts and Crafts Movement principles of design and respect for the individual, they welcomed their first tenants in 1903. Inspired by the proximity to the Tate, each block is named after an English artist. The gardens are overlooked by the Turner, Ruskin, Millais and Leighton Houses, which embrace the space and reflect a terracotta warmth even under today’s damp blanket of cloud. The exercising trio have gone. Two young sisters wearing Rudolph antlers are now playing on the gym equipment, supervised by their Dad. They’re joyfully singing ‘Walking in the Air’. Emerging from Tower Hill Station into a whiff of traffic fumes with a hint of riverside aroma, which penetrate the chill of this bright day; I’m faced with a truncated fragment of the ancient City Wall, rising to over 10 metres: a curtain of ragstone and red tile- strata of many centuries; almost half its height surviving from Roman times. This wall and its defensive moat (known later as the Citie’s Ditch), was originally built around 200AD. A statue of the Roman Emperor Trajan stands proudly in front of this wall and gestures with his right forefinger (see photo below: an 18th century bronze, allegedly discovered in a scrap yard in Southampton by Reverend T B ‘Tubby’ Clayton, founder of the Toc H charity). His pointing finger leads the eye towards the raised walkway through to Tower Hill Gardens on the other side of the wall. The wall shades a segment of the low grassy rise of Tower Hill. Play equipment is set into patchy grass. I set up to draw the view from here across to the walls and turrets of the Tower of London. But the sun, strong to the south, flickering and dazzling through the mass of hanging plane twiggery, turns the ancient ramparts to a grey- violet silhouette and I have to peer hard to make out its many windows and battlements. And over to the west, the Shard is a soaring blade of pure glassy blue. The relentless flow of traffic rumbles the dual carriageway road between, and pulls to a halt at the lights at the junction here. The squeal of brakes a persistent theme. The garden is busy with tourists. A family sit with a picnic while young daughter whooshes down the slide and then scrambles back up the earthy slope to go again. Tower Hill is less a hill and more a gentle rise up from the banks of the Thames, but elevated enough to offer commanding upstream and downstream views, which made this an ideal defensive location (there is talk and some evidence for an early Celtic fortress here). And a good strategic position just within the eastern walls of Roman Londinium. After the decline of Roman rule, followed by 400 year of neglect and Viking occupation, London’s walls were restored by Alfred the Great in the 890s. The Tower of London was built by the Normans soon after their conquest of Britain in 1066. Surrounded by a moat and high walls, the White Tower was the castle’s keep, built to be impregnable and commanding. It was a powerful symbol of the power of the new King William and was used as a royal residence. Over succeeding centuries its function changed variously to a prison, an armoury, a treasury, a private zoo for exotic animals (including lions), to house the Royal Mint, as a public records office and to guard the Crown Jewels. The area around it became known as the ‘Tower Liberties’, an area that could not be built on, defined by the distance an arrow could be fired from the Tower. So Tower Hill remained undeveloped. A 20 metre wide stretch of water, known as the Citie’s Ditch, ran through here, at the foot of the Wall (where the children’s playground now stands). It emptied through a channel into the Tower’s moat. At that point, where now run buses and articulated lorries, was once where tracks converged from the farms and villages outside the eastern city walls, to squeeze through a postern gate. Over the centuries, despite attempts to dredge and clear, it grew foul and choked with rubbish and waste. By 1700 the Citie’s Ditch had been filled in. The screech of a child pierces through the traffic noise: the sliding girl isn’t happy about being wrenched away from her slide. Then a loud slapping noise! I look across: the mother is crashing the soles of her daughter’s shoes together to get rid of the accumulated mud. Drawing finished (see image at top), I hastily pack my things. The woman has gone and I’m curious about what she was picking up. I go over and very quickly find some coins. I pick them up: one of the old large 5p (shilling sized) coins, smeared in mud. And there’s a shiny 2p coin. And then I see more. And more! Lots of different coins all around: some bright and new on the surface, and some hidden, just circular edges poking out of the earth. I prise up some more: old halfpenny pieces. I have a handful now and think about putting them in my pocket, but then start to wonder why coins have been thrown here apparently over a long period. Perhaps they’re offerings. Or wishes. I can’t take away people’s wishes! I throw them back on the ground and push them in with my heel (a mystery! Despite research, I haven’t been able to find any reference to a practice of coins being thrown here). I wander the 2 minutes across to Trinity Square. A steaming americano bought from the Tower Hill Tram coffee stand to warm me up. Into this 1¼ acre space of lawn; winter bare trees and evergreen shrubs around the edge. I follow the perimeter path around to the site of Tower Hill Scaffold. From 1381 public executions were carried on this raised patch of rough ground. A permanent site was established a century later. Today marked out by cobbles and chains (see photo below), with plaques to commemorate those put to death on this poignant spot. I set up to lay this historic spot across the foreground of my drawing. Executions were a popular but grisly spectator ‘sport’, with viewing stands, raucous crowds, street entertainers and vendors. Over 350 years, at least 125 prisoners, political and criminal, lost their heads here, most of them from the aristocratic classes, including Sir Thomas More (see ‘Sticks in the Smoke 35’ Ropers Garden) and Thomas Cromwell. In 1747 Simon Fraser, 11th Lord Lovat, was the last beheading to take place in Britain. Apart from the carnival atmosphere of the public executions, Tower Hill had been a neglected piece of ground until, by the 18th century, local residents were getting annoyed at the dumping of rubbish, unlicensed quarrying, attacks by footpads and anti- social behaviour. Parliamentary Acts were passed authorising the creation of Trinity Square and surrounding streets. The gardens were laid out in 1795, overlooked by the neoclassical home of Trinity House (the charity dedicated to safeguarding shipping and seafarers), designed by Samuel Wyatt (innovative architect of lighthouses and industrial mills). He set out the gardens in the form of an oval, with a surrounding path, much as they are today. Its use was governed by strict bylaws, limited to permit holders and residents of the square. Other grand buildings around the square include the Port of London Authority Building, built in 1922 (by Sir Edwin Cooper) with its impressive classical frontage. The maritime character of the square’s occupants made this a fitting location for memorials to the seamen of the Merchant Navy and fishing fleets lost in 20th Century wars. A large, classical temple, designed in the 20s by Sir Edwin Lutyens, bronze plaques engraved with the names of the 12,210 lost in the First World War, sits solid over my sketchbook page (see drawing at bottom). And the 8ft walls of a sunken garden behind me (see photo left), designed by Sir Edward Maufe, are set with bronze plaques to remember the 23,765 lost in the oceans during the Second World War, punctuated by 7 tall stone reliefs of allegorical figures representing the seven seas, by sculptor Charles Wheeler. The most recent addition at the east corner of the gardens, is a round memorial set at a keeling tilt, engraved with: ‘In Memory of those Merchant Seafarers Who Gave Their Lives to Secure the Freedom of the Falkland Islands in 1981’. With these sombre memorials and the Scaffold site, this place is definitely ‘park as Memento Mori’. Smoke billows from one of the memorial temple’s porticos: a workman leans on its sill, puffing on an e- cigarette. As the light fades fast, the darkened pillars and turret turn into the superstructure of a great ship, steaming towards the sunset. I abandon painting and try to commit the changing colours to memory as the pinnacle roofs of Tower Bridge in the background catch the last russet rays of sun. And two vapour trails scratch a silver blue cross into the pink blush of the sky.